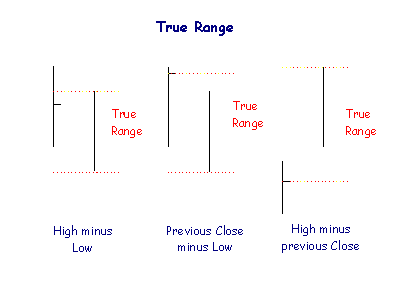 This ratio is similar to one used by Jack Schwager in Technical Analysis to identify wide-ranging days. 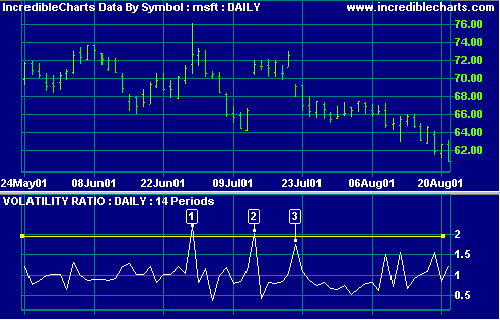 Microsoft Corporation with 14-day Volatility Ratio (VR). A wide-ranging day signals a likely reversal. A downward gap signals the completion of an island cluster reversal, formed by  and . The default period for Volatility Ratio is 14 days. To alter the default settings - Edit Indicator Settings. See Indicator Panel for directions on how to set up the indicator. Yesterday's Close minus today's Low.